V is for Vaangi Bhaat. Inching our way towards the end of the alphabet, we arrive at "V"! It is a letter of several complex and spicy Marathi dishes. Most of the "V" foods need a bit of time and effort to make, but are so worth it in the end. The most sought-after V is Vada or deep-fried fritter...a general term that in fact encompasses a wide variety of tasty morsels. The darling of all Maharashtra is the potato fritter or batata vada, spicy mashed potatoes formed into little balls, dipped in a thick chickpea batter and deep fried to a golden brown. A great way to convert these into a quick meal is to sandwich them in a bread roll to make vada pav, a food sold on street corners everywhere in Maharashtra. See my recipe for these goodies here. 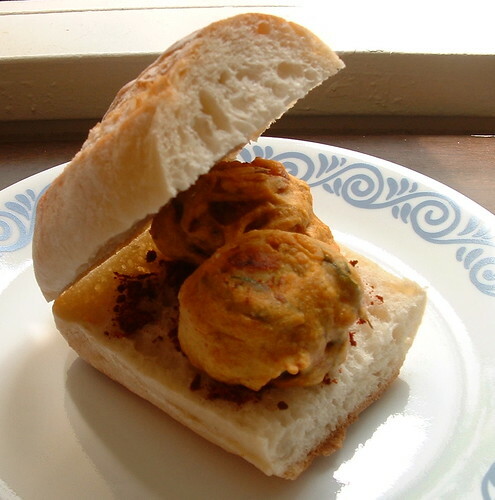 I can't resist adding the picture of vada pav again in this post...By the way, the combination of batata vada and sheera is a classic, often served at tea-time get-togethers. Another slightly unusual vada is made by combining different flours into a dough, making a flattened doughnut-shaped disc with the dough and deep-frying it. This vada is traditionally eaten in a combination with chicken curry, called vada-kombda ("komdba" is rooster). The chicken curry is quite dispensable; the vada tastes just as wonderful with any spicy lentil curry. In the produce section, "V" stands for vaangi or eggplants; in India ones we find small eggplants that would fit in one's palm, unlike the huge Italian ones that are more common in the US. They are well-beloved in Marathi foods and most popular preparations are bharli vaangi or stuffed eggplants, which we made already in the "B" of Marathi food, and vaangi bhaat or eggplant pilaf, which we shall make today. Vaangi bhaat is popular all over Southern India, a culinary vestige of the Maratha invasion of Southern India in centuries past. In talking about eggplants, I should not forget to mention vaangi bharit, a dish of roasted eggplant popular in many sub-cuisines of India, and better known by its North Indian name, baingan bharta. Another important "V" veggie is vatana or green peas. In India, this is a winter vegetable and for just a few months during the year, plump little pods show up in the markets. I remember as a kid, my mom would often recruit me to help shell peas while in season, and store them away in baggies in the freezer for use throughout the year. Two favorite "vatana" preparations are vatana patties made in the same way as these patties were, replacing beans with peas; and vatana amti a wonderful peas curry with a coconut base. Speaking of peas, we cannot forget the "V" beans, vaal, also known as dalimbay. We already made a rice dish with these in the "D" of Marathi food, but they also can be made into vaalachi usal as a semi-dry preparation. We finish up the "V" foods with the sweetness of velchi/veldoda or cardamom, which is my absolute favorite spice. Cardamom is found in almost Indian dessert (often paired with saffron) and in Northern India, cardamom is used in savory foods to dramatic effect. Cardamom pods tucked away in one's pocket or purse make for a convenient and effective (not to mention sugar-free) breath freshener. On to our "V" dish, vaangi bhaat. Now deciding on one "authentic" recipe for this dish was well-nigh impossible! This rice dish can be made with stuffed baby eggplants or just with cubed eggplant; the spice mixture can be one of many different combinations. So here is my disclaimer: after sifting through many recipes, and thinking back to all the vaangi bhaat I have eaten in my life, I present to you my very own version. No claims that this recipe is THE ONE. It tasted great though! 1. Wash the eggplants, trim away the stems, slit part-way into quarters. 2. To make the masala paste, heat the oil, saute all the masala ingredients and grind into a fine paste. 3. Stuff the masala paste into the eggplants and set aside. 4. Heat 1 tbsp oil, add the cumin and mustard seeds, then saute the bayleaf and onions. Add the salt and turmeric and then the rice. Add 2 1/4 cups of water and let it come to a boil. 5. Simmer the rice for 2 minutes, then add the eggplants, placing them in the pot gently. Simmer the mixture till the rice is tender. By then, the eggplants should also be tender to the fork. 6. Garnish with cilantro and serve hot. 1. It has been brought to my attention that sometimes, the eggplants do not cook by the time the rice is tender. 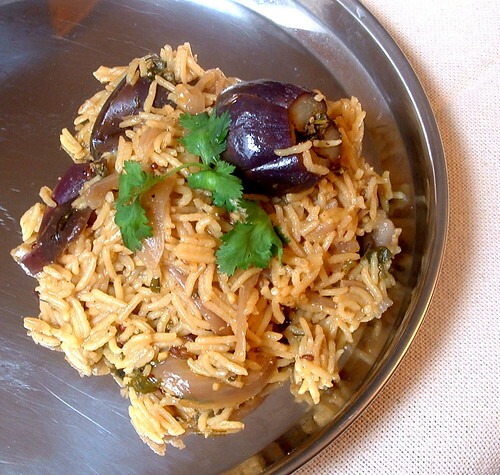 I usually make this rice in the pressure cooker and have no problem with the eggplants getting cooked. If you are making it on the stove-top, you might want to partially cook the stuffed eggplants either in a pan or in the microwave before proceeding to cook them with the rice. 2. To make this dish with eggplant cubes, simply saute the masala paste and the cubes with the rice and proceed. 3. To make "masale bhaat", substitute mixed veggies (cauliflower, green pepper, green peas, carrot, potato, eggplant) for the eggplants. 4. Make sure the heat is low and that you watch it often so as not to overcook the eggplants (they fall apart). 5. Serve with a generous dollop of ghee, some papads and yogurt for a complete meal. See you soon for the "W" of Marathi food! Have a great weekend! 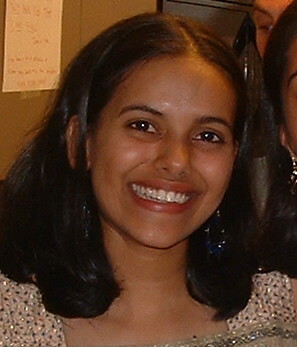 Its Vaangi Bhaat for lunch tomorrow.I am going to try your recipe.The picture looks great,Nupur. I tried your Pav Bhaji today and WAS IT GREAT!!! Your Aunt M must be a genius. I mean, I could have never imagined that the magic trick could be as simple as 'not sauteing onions'! Now that is something all the recipe books that I have ask me to do. Neither has anybody in my family ever made this 'mistake':) I must say, this was the first time ever that Pav Bhaji made at home tasted like the 'original' stuff. Thanks for the recipe and thanks for sharing the secret. I stuck to your recipe and measurements through and through apart from one addition. I added 3-4 tablespoons of beetroot juice to get the deeper red colour. Ekdum 'hotel' type rang yenyasathi. Well, thanks again. Now, what's for W? Maybe 'polya' as whole wheat flatbreads? Can't think of anything else. I am sure you will. Thanks for the nice comment on my cheese sandwich announcement. Very much appreciated. I made Thalipeeth today, and was writing about it to someone. I looked up Thalipeeth, and your blog came up. I just browsed through A throgh V of marathi food. Looks great! I will certainly try your recipies. Have you thought about putting together a book with your A-Z of Marathi Food? I am probably thinking farther ahead than you'd like me to....but could we have Zunkha-Bhakhar for Z please?? Hi Sailu, let me know if it works out! Vaishali, thanks so much for letting me know! M "maushi" is certainly a genius...and I love your addition of beet juice as a natural food dye. Hi Kalyn, rooting for you all the way. BDSN, yes, fresh masala does make a lot of difference. Come over for a meal anytime!! Thank you so much for the recepie... it was simply yumm... but just one question... my rice looked the yellow colr of the turmeric , but in the pic it looks more red?.... how do u do it? Usha, it is actually turmeric *powder*, the paste was a typo! Thanks for pointing it out! What?! I can't believe that we are at V already. I have to catch up on some writing from O. Thanks for the great recipes....I'm pregnant and I've got a craving right now for all the homemade dishes which we used to eat as kids! Your blog is great source for this.....keep up the good work...! Definitely a comfort food, I remember eating it with Batata bhaji....ummmm, my favorite. I am surprised you didn't have B for Batata bhaji. I'll try adding some curry leaves next time... always looking for recipes to add these leaves. newbie cook here with a basic question. when should the mustard seeds and cumin be added? is it before the bayleaf+onion or after?